Great musicians, it is said, lift the notes off the page and bring them to life. According to this theory, McAllister and Goodson are Olympic powerlifters; they can take some pretty heavy music and toss it off nonchalantly with their nimble fingers. Similarly, skilled drivers can make a Hyundai seem like a Ferrari; poetry in motion. In Transit is not your average sax and piano recital; it is a manic drive through some of the tricky chicanes with plenty of opportunities to crash and burn along the way (which they never do BTW). Five composers have designed the musical obstacle courses: Etezady's Streetlegal does for sax and piano what NASCAR might do around a small Italian town; a blazing thrill ride on the edge of considerable danger. 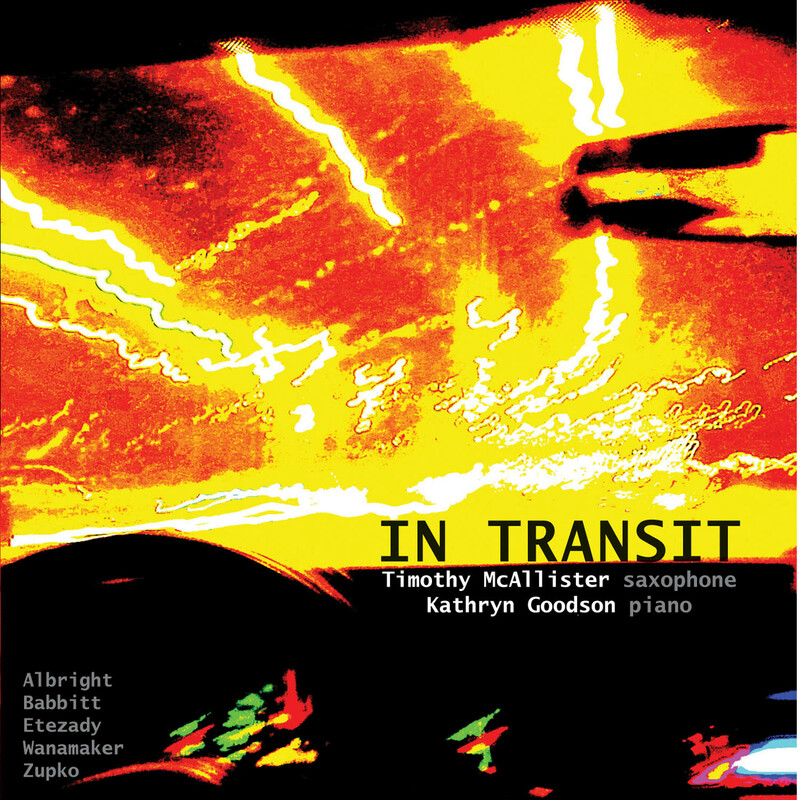 Albright and Babbitt live up to their pro status; Wanamaker takes the sax into uncharted mechanical terrain and Zupko's "In Transit" takes a pop song written by his grandfather in the 40s to new extremes. This is chamber music on Red Bull. Timothy McAllister is (at least) one quarter of the renowned PRISM Quartet. Kathryn Goodson is (not just) a Michigan pianist and teacher. Together they have played from Paris to Peru. It's a little hard to think that the saxophone has been kicking around since the middle of the 19th century. Though its intended home was the European orchestra, it found a more hospitable environment in American jazz and popular music. This recording seems motivated in part by a need to show that the classical world hasn't entirely forsaken the instrument. The program is very diverse, allowing young composers to appear alongside the works of a couple more established names. By far, the highlight of the disc is William Albright's Sonata. I knew the piece had a reputation as a major piece within the saxophone repertoire, but after hearing it, I see no reason why its status has to be qualified as "within the saxophone repertoire." The performances on all the tracks are extremely committed. McAllister and Goodson obviously care a lot about this music (it's worth noting that they commissioned all three of the younger composer's pieces).